MYMCA is pleased to partner with Zivot to offer SAF AQUA DRUMS VIBES programmes! SAF AQUA® Drums Vibes is a high energy fusion of Drumming, Aerobics and Dance. It uniquely blends the power, speed and agility of a drummer with exhilarating aerobics moves under hydro-resistance. Beat to the sounds of rhythmic music and relieve stress, unleash emotions, all while burning off extra calories! SAF AQUA® Drums Vibes is a combination of rhythmic drum with a new equipment. This is a completely new approach to hydro training, suitable for people who are not suitable for high impact sports due to weak joints. The programme is conducted by professionals with utmost attention to safety. Most of the movements are controlled and done in isometric tension. 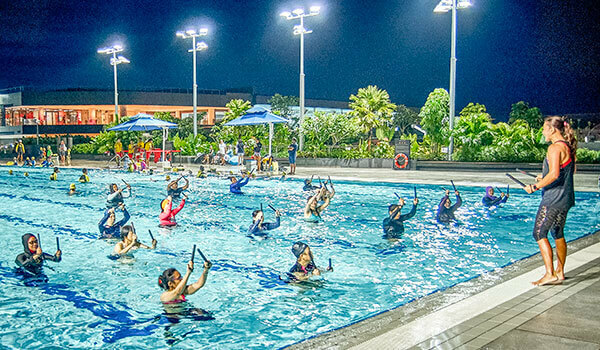 During SAF AQUA® Drums Vibes, you get to work all your muscle groups, including deep muscles, thanks to the turbulence of water. Every move has a start in the core and basis in stabilization. The variation in positions make it a complete body workout. It is not only effective training, but also great fun! Play drums in water! Let the pool erupt in a volcano of energy! SAF AQUA® Drums Vibes Sticks are specially designed in optimised length and diameter, so as to increase the resistance while you extend your arm in water. As they are in the form of sticks, they do not cause excessive wrist strain and allow you to focus on your workout and have fun. Come and have a trial class with us to test how you feel after a full body workout!